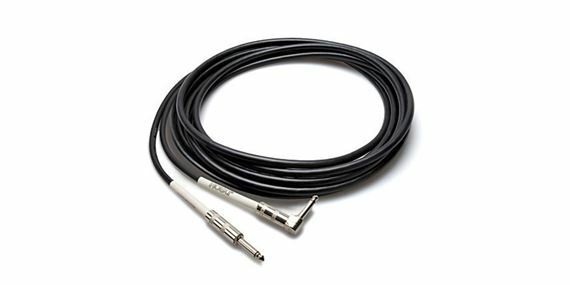 Shop Hosa Guitar Instrument Cable with One Right Angle Plug from AMS and enjoy Fast & Free Shipping. The Hosa Guitar Cables with one right angle plug are designed to provide years of dependable service. High-quality components and world-class manufacturing combine to deliver products of exceptional value. Well made, great price and appears durable enough to gig with. Well done Hosa,well done! Does what a cable should do. Hosa has always been good to me. Highly recommended! I wanted a short cable to connect guitar pedal to amp and it's been quiet ever since. Sometimes slight hiss but my old cord added a lot of noise. Now I don't need the noise reducer pedal. Gets the job done nicely and you simply can't beat the price. This cord is the length I need and the right angle connector end works well with the position of my ToneWood amp on my Taylor guitar! Sturdy!